Ring up sales 365 days a year. Whether you’re taking advantage of the year’s busiest shopping season or turning a traditionally slow day into a productive one, use a holiday template to put customers into a festive shopping mood. 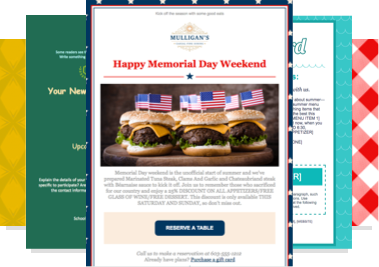 Our powerful editor makes it easy to match your brand to a holiday email template. Choose your colors. Add your text, logo, and images. Customize with a drag, drop, and click. 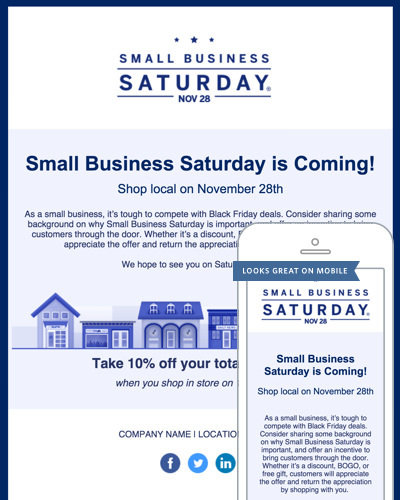 Plus, all our email templates are mobile responsive. Constant Contact delivers email campaigns more reliably than services like Gmail and Outlook—while also helping you track results like opens, clicks, and bounce rates. Access free images or use your own. Easily upload your images, or choose from our selection of free and low-cost stock photos. Get the help you want, when you want it. Real people are just a call away, and you can explore our online resources at any time. 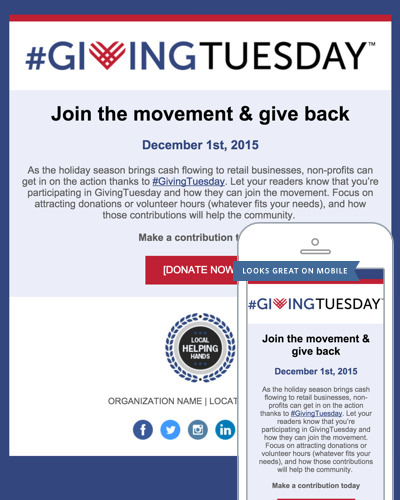 Or, let our experts create a holiday email template for you. See a full list of services. "After I sent our Cyber Monday email my phone didn’t stop for the next 10 hours! I was literally taking calls at midnight." Templates for every kind of email. Share a new product or promote a special occasion quickly and easily. Send a simple letter, flyer, or update to your subscribers. Send email invitations or save-the-dates. 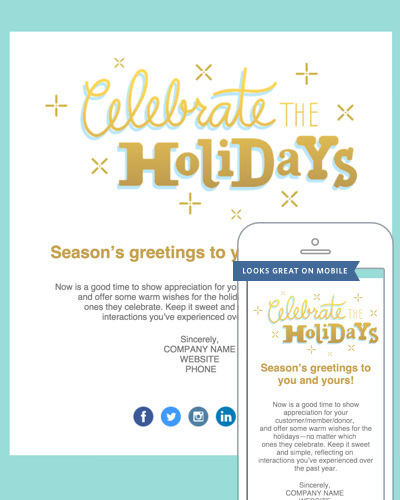 Send seasonal emails that delight your subscribers. Easily use your own custom code to create your HTML template. Stay top of mind and deliver valuable news. Professional-looking follow-ups and reminders will impress. Your audience loves to feel appreciated—and you’ll look good doing it.